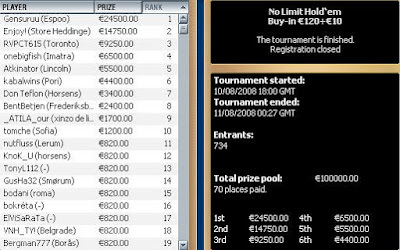 Uncategorised Largest Online Tournament win to date - but still cursed on the river! Largest Online Tournament win to date - but still cursed on the river! Sunday was a very good day for me. I played two tournaments, a €100+10 invitational tournament STT with added money, and the €100,000 guaranteed weekly tournament on Boss Media and got good cashes in both. The poker.co.uk invitational, open to the top 10 rakers and top 10 most profitable players attracted 10 players. All ten were still in I believe after 2 hours which was pretty crazy. I won a pot early to give me 3000 chips to the 2500 starting stack and never went below that. I thought I generally played very well but to be fair my accumulation of chips came down to 3 preflop coinflips. I bust a short stack with KQs vs 22, I think there was a JJ v AK in there and I can't remember the other one, but again the hands were about equal in value. 3 handed I picked up a lot of decent hands which led me to be rather aggressive. I was quite fortunate in a pot where Matt Dale limped from the sb and I checked with 9T. He checked the flop, as did I as I had none of it. He bet half the pot on the turn and I had picked up a double belly buster draw, which I like to play cos they're so disguised. I hit it on the turn and picked up a nice pot when he bet into me on the river and called my raise. He later told me he flopped two pair. The other player bust Matt later on and it was heads-up, my speciality. We were about even in chips and I took control of the match. I worked my way to a 2:1 chip lead. I had been raising a lot on the button and took the opportunity to limp with 66. He shoved all-in, for about the 4th time as the first raise. I called knowing he could easily have 22-55 or even A5s or something, but he had A9 off. It was looking good, and I was all ready to win the tournament with his 6 outs going to the river, but sadly he hit the 9. Instantly the blinds went up and I had a dry spell of cards. He was nearly 3:1 chips after raising a few hands in a row, and I 3 bet shoved A5s to yet another raise. He had AQ I think and took the tournament down. Damned 9. Nevertheless a good ROI, winning €900. 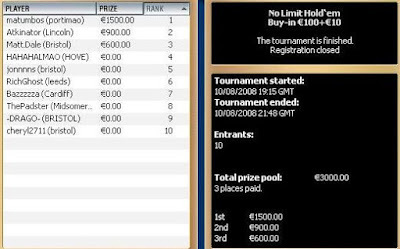 Before this had started I started playing the €100k guraanteed with a €120+10 buy-in. This one had 734 runners. Early doors I made a hero call on a 2QJ52 board with 33 in a three-way pot to give me some chips (dude pot bet the turn and shoved the river with A7, I was sure I was good). I doubled up when I hit the magical top set with 99 and handily for me my opponent had slow played Aces preflop, only calling my original raise. It went all-in on the flop. I just played good poker from there on in, with the help of railer Dafydd Elias cheering me on. I did get a lucky spot somewhere in the middle when UTG open shoved with KJ for about 10bbs and I had Aces in mid-position. But if people want to give gifts, who am I to stop them! I was taking enough pots to stay in a nice position all the way down to two tables. Made a beautiful squeeze shove with 88 that had my heart pounding and landed me a good wodge of chips. I had a hand with 12 players left which would have made me the clear chip leader, when I 3 bet shoved JJ. I was called by AK off, but he hit runner runner clubs to four flush me on the river, and I was back to just below average. Final Table and I managed to pick my spots to stay around average, while players were gradually knocked out. Sadly I lost yet another coin-flip, again against AK but this time holding QQ. Now I was the short-stack. Finally though it was my turn to win a coinflip though as I shoved 55 from the sb, doubling through AJ calling in the bb. I built up my chips without elimiating anyone, but the other stacks were getting bigger from eliminations. 5 left and I was the shortest stack, but still had 150k which was 10bbs. Then a guy who had been playing tricky min raised and I picked up QQ in the small-blind. I shoved it in, and he made a quick call. He flipped over pocket tens. Beautiful. I had tried to keep my eye off the payouts to this point, only keeping an eye on the bubbles and things to see when players would tighten up. But I was pleasantly surprised to see I had reached the €5,500 mark. This marked my biggest online tournament victory to date. Perhaps you'd have expected me to have a bigger win by now in my poker career, but I really haven't played that many big online multis. Obviously I can't help but wonder how much I would have won if that 10 hadn't hit, but for a days work I had to be happy with my 2 tournament cashes. 0 Comment to "Largest Online Tournament win to date - but still cursed on the river!"